The Ramakrishna Math & Ramakrishna Mission have been rendering relief and rehabilitation services to the victims of natural and man-made disasters for more than a century. This comprehensive annual report covers such services rendered by the Math and Mission in the financial year 2016-17. The total expenditure incurred for the relief activities during this period was nearly Rs. 42.79 crores (Indian Rupees 428 million). (i) Assam: In the wake of devastating floods caused by incessant rains and breach of riverbanks in Dhemaji district, Itanagar centre distributed 7600 kg rice, 1900 kg dal (lentils), 380 kg edible oil, 190 kg gur (molasses), 380 kg salt, 3800 matchboxes, 760 bars of soap, 380 kg detergent powder, 760 packets of candles, 760 mats and 380 utensil sets among 380 affected families in Jonai sub-division on 11 September. Karimganj centre distributed 1100 kg rice, 210 kg dal, 200 packets of biscuits, 100 kg salt, 300 kg potatoes and one lakh halogen tablets among 810 flood-affected families in 11 villages of Karimganj district from 30 May to 8 June. (ii) Bihar: Chapra centre distributed 4000 kg chira (rice flakes), 850 kg gur, 5811 saris, 5227 dhotis, 1000 blankets and 960 jackets among 9183 flood-affected families in 45 villages of Chapra district from 22 August to 5 December. Katihar centre distributed 150 saris, 150 dhotis, 150 solar lamps and 1000 blankets among 1000 affected families in Katihar district from 26 September to 4 November. Patna centre distributed 12,810 kg chira, 4100 kg gur, 4300 kg sattu (gram flour), 4200 kg salt, 1250 litres of fruit juice, 24,000 candles, 19,775 matchboxes, 6480 saris, 6000 dhotis, 960 jackets and 1000 blankets among 7250 families in 15 villages of Patna and Rajgir districts from 25 August to 1 December. (iii) Jammu and Kashmir: Following a flash flood which affected Kund area in Ramban and Udhampur districts, Jammu centre distributed 1500 kg atta (flour), 600 kg dal, 600 kg edible oil, 600 kg sugar and 300 utensil sets among 300 affected families on 27 May. (iv) Madhya Pradesh: Allahabad centre served cooked food to 2000 people and distributed 2000 kg atta, 304 kg rice, 464 kg dal, 152 litres of edible oil, 1560 kg potatoes, 232 kg salt, 304 kg sugar, 465 saris, 160 dhotis, 58 leggings, 464 bedsheets, 1000 blankets, 1545 bamboos and 80 plastic sheets among 769 flood-affected families in 7 villages of Rewa district from 22 September to 22 January. (v) Telangana: Hyderabad centre served cooked food and distributed bread, biscuits, milk, etc. to nearly 1000 affected people in Banjara Hills, Lalapet and Begumpet areas of Hyderabad from 24 to 26 September. 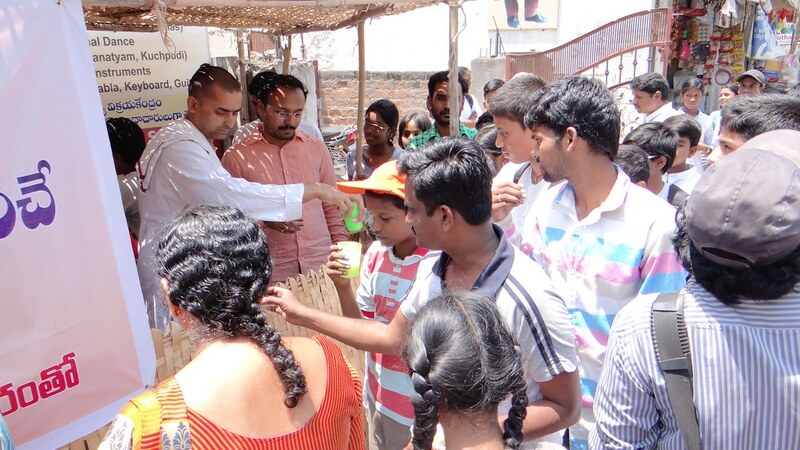 (vi) Uttar Pradesh: Allahabad centre distributed 1020 kg chira, 500 kg gur, 25 kg milk powder, 1248 packets of biscuits, 1020 bottles of drinking water, 60 saris and 40 T-shirts among 707 affected families in various areas of Allahabad district on 24 and 25 August. (vii) Uttarakhand: Shyamla Tal centre distributed 1750 kg rice, 1400 kg atta, 280 kg dal, 140 litres of edible oil, 49 kg assorted spices, 140 kg salt, 35 kg milk powder, 140 kg sugar, 35 kg tea, 280 candles, 700 matchboxes, 60 solar lamps, 70 torches, 140 saris, 70 sets of salwar-kameez, 300 jackets, 67 tarpaulins and 225 blankets among 75 families affected by flash floods and landslides at Bastari and Deval Majhera villages in Pithoragarh district on 20 July. (viii) West Bengal: Antpur centre distributed 30,600 kg chira and 450 kg sugar among 8610 affected families in Udaynarayanpur block of Howrah district and Jangipara block of Hooghly district from 25 to 28 August. Cooch Behar centre distributed 200 kg chira, 100 kg muri (puffed rice), 50 kg gur, 51 saris, 144 dhotis, 81 shirts and assorted clothing among 342 flood-affected families in Cooch Behar district on 20 and 25 July. Dhaka centre distributed 700 kg rice, 175 kg dal, 175 litres of edible oil, 350 kg potatoes, 1050 ORS packets and 350 saris among 350 affected families in various areas of Kurigram district on 12 August. Jessore centre distributed 8000 kg rice, 3200 kg potatoes, 670 kg chira, 540 packets of mosquito-coils, 540 packets of detergent powder, etc. among 1800 flood-affected families in Manirampur, Keshabpur and Abhaynagar Upazilas in Jessore district from 1 to 4 September. Kathmandu centre distributed 1590 kg rice among 636 flood-affected families in Pathamari area in Jhapa district from 28 to 31 July. Karnataka, Maharashtra and Telangana: As insufficient rainfall and searing heatwave caused drought situation in some parts of the country, our Belagavi, Ponnampet, Aurangabad, Pune and Hyderabad centres conducted extensive drought relief work by distributing 2,24,72,800 litres of drinking water among 66,679 families in Belagavi, Kodagu, Satara, Ahmednagar, Aurangabad, Ranga Reddy, Warangal, Karimnagar and Adilabad districts from 8 April to 7 July. Nepal: Continuing its relief work among the families affected by the devastating earthquake that had struck Nepal in April 2015, Kathmandu centre distributed 229 blankets, 50 wheelchairs, 3831 utensil sets, 900 bamboos and 1020 CGI sheets among 4274 families in Lalitpur, Kavre and Kathmandu districts from 27 March to 27 July. (i) Arunachal Pradesh: Following an accidental fire in the nearby Ngomdir village, Aalo centre provided medical assistance to 57 affected patients on 21 January. (ii) Assam: On 1 April, Guwahati centre distributed 130 saris, 130 dhotis, 130 T-shirts, 130 ladies garments, 130 blankets, 130 bed-sheets, 65 kg detergent powder, 260 tubes of toothpaste, 520 pouches of hair oil, 260 plates, 260 tumblers, 260 bowls and 130 jugs among 130 families affected by an accidental fire at Bishnupur locality in Guwahati. In the aftermath of a devastating fire that broke out at Gopinathnagar-Pukurpar area in Guwahati, our Guwahati centre distributed 27 blankets, 13 mosquito-nets, 20 saris, 20 dhotis and 13 utensil sets among 13 affected families on 12 March. From 27 to 29 August, Karimganj centre distributed 21 saris, 51 dhotis, 14 packets of biscuits, 21 utensil sets and 55 blankets among 41 families affected by an accidental fire at Charbazar area in Karimganj district. Narottam Nagar centre distributed, on 3 November, 35 blankets and 35 sweatshirts among 35 families affected by an accidental fire at a slum in Tinkonia area in Tinsukia district. On 2 March, Silchar centre distributed 65 saris, 30 dhotis, 40 mosquito-nets, 65 scarfs, 8 kg milk powder, 11.2 litres of milk, 14.4 kg biscuits, 100 notebooks, 30 pens, 30 pencils, 30 sharpeners and 30 erasers among 40 families whose houses had been destroyed in an accidental fire at Chengkuri Road area in Silchar town. (iii) Bihar: On 3 May, Katihar centre distributed 2125 kg rice, 552 kg muri, 490 kg chira, 85 kg sugar and 85 utensil sets among 85 families affected by an accidental fire at Rampur-Mohanpur locality in Araria district. (iv) Odisha: Following an accidental fire in Gadadharpur village in Cuttack district, Bhubaneswar centre distributed 100 saris, 100 lungis, 50 sataranchis (carpets), 50 bed-sheets, 100 towels, 50 torches, 50 umbrellas and 50 utensil sets among 50 affected families from 1 to 4 June. (v) West Bengal: Malda centre distributed 5000 kg rice, 750 kg dal, 250 kg salt, 625 litres of edible oil, 500 kg sugar, 125 saris, 125 lungis and 125 utensil sets from 1 to 28 May among 125 families affected by an accidental fire in Malda district. (i) Andhra Pradesh: On 15 and 16 September, Vijayawada centre distributed 250 kg rice, 100 kg red gram, 50 kg sugar, 25 kg tamarind, 50 litres of edible oil, 50 kg flour, 100 towels, 100 dupats (rugs), 100 saris with blouses and 50 utensil sets among 50 affected families of Macherla village in Guntur district. (ii) Tamil Nadu: In the wake of the Cyclone Vardah which struck a major portion of coastal Tamil Nadu, Kanchipuram centre distributed 131 tarpaulins among an equal number of affected families in 7 villages of Kanchipuram district from 12 to 27 December. Chennai Students’ Home distributed 250 kg rice, 40 kg sugar, 20 kg tamarind, 20 kg dal, 20 kg salt, 20 kg white beans, 30 kg edible oil, 9 kg assorted spices, 20 mats and 200 kg various vegetables to 20 poor tribal families in Kallur village in Thiruvallur district from 13 to 16 December. 102 hand tools, 7 cartons of utensils, 2000 water containers (of 20 litres size), 1515 buckets, 8553 packets of agricultural seeds, 266 rolls of fishing line, 110 computers and 125 sets of school uniforms among 13,513 persons in Rakiraki, Tavua, Taveuni, Nadi and Ba areas from 22 March to 25 September. Medical relief was provided to 6178 patients during the period. Assam and West Bengal: In the wake of a severe storm, Silchar centre supplied 863 tin sheets among 111 families of 17 villages in Barak Valley from 5 to 13 May. In the wake of a severe storm, Ramharipur centre distributed 186 asbestos sheets, 155 tin sheets, 60 tin matkas, 500 tile matkas, 4000 roof tiles, 33 polythene sheets and 26 kahans (sheaves) of hay among 58 affected families of 14 villages in Bankura district from 12 to 18 June. Bangladesh: Dhaka and Habiganj centres distributed 1500 kg rice, 150 kg flour, 300 kg dal, 150 litres of edible oil, 150 kg sugar, 300 saris, 150 dhotis, 150 lungis, 150 plates, 150 tumblers, 300 blankets and 560 tin sheets among 220 families affected by social disturbance in Nasirnagar Upazilla in Brahmanberia district on 19 November and 10 December. 78,160 litres of buttermilk was served by our Chennai Mission Ashrama to about 62,000 people, by Hyderabad centre to 1,60,018 people, by Salem centre to 27,266 people and by Sargachhi centre to 1572 people during the summer months. In 2016-17, a total of 49,102 blankets and 1,16,365 winter garments (51,296 sweaters, 11,694 sweatshirts, 42,372 jackets, 1080 coats, 513 ladies warm garments, 612 flat-knits, 8758 mufflers and 40 shawls) were distributed through 97 branch centres in India and 5 branch centres in Bangladesh among the poor people affected by severe cold, flood, fire, etc. West Bengal: As in previous years this year also, Seva Pratishthan centre organized a round-the-clock medical relief camp during Makar Sankranti Mela at Sagar Island in South 24-Parganas district from 10 to 16 January 2017. In all 7389 patients were treated, out of which 8 received indoor medical-care. Besides, 150 blankets were distributed among the poor pilgrims and monks. Moreover, the Headquarters distributed 400 blankets to the monks and mendicants of the Makar Sankranti Mela who visited Belur Math on their way to Gangasagar. 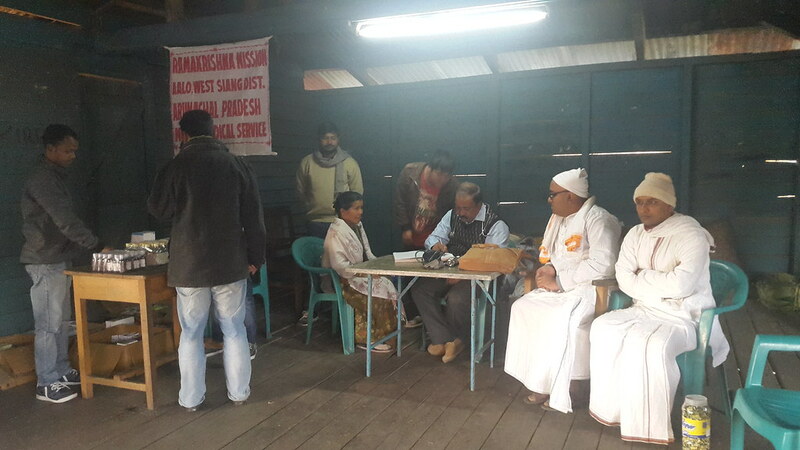 West Bengal: From 13 to 15 January, Seva Pratishthan centre organized a medical relief camp during the Jaydev Kenduli Mela in Bolpur sub-division of Birbhum district in which 619 patients were treated. Asansol centre erected a temporary rest shed (100 ft. x 70 ft.) made of tin sheets, which housed 650 pilgrims per day from 13 to 15 January. The 499 tin sheets were distributed among 88 poor families in Birbhum district from 24 January to 11 February. (a) Antpur: 46 sewing machines, 15 rickshaw vans and 175 sets of weaving accessories in February and March; (b) Chandipur: 11 sewing machines; (c) Guwahati: 6 sewing machines; (d) Khetri: 67 sewing machines; (e) Malda: 7 sewing machines and a handicap tricycle in March; (f) Ponnampet: 11 sewing machines; (g) Puri Mission: 10 hand-carts; (h) Rahara: 8 sewing machines, 4 rickshaw vans and 2 cycle-rickshaws. (i) Andhra Pradesh: Vishakhapatnam centre completed a water supply project under which it has laid 10,000 metres of HDP pipeline and supplied 10 water tanks to facilitate the supply of drinking water to 265 households belonging to 10 villages in Visakhapatnam and Vijayanagaram districts. (ii) Maharashtra: Aurangabad centre installed 7 water filters in 7 schools, sunk 2 bore-wells and installed a pump set in Aurangabad district from 3 to 27 February. The centre also distributed 380 drums (110 litre) for storing water among 380 poor families in Aurangabad district during the same period. On 18 September, Pune centre inaugurated the water conservation project which involved dredging of 2.5 km stretch of the river Kanadi at Shiur village in Ahmednagar district. (iii) Telangana: Hyderabad centre installed 7 Reverse Osmosis Plants in Antappaguda, Devala Thirumalapur, Devalabhadra, Gajulaguda, Laxmi Reddy Guda and Machinenipally villages in Ranga Reddy, Mehaboobnagar and Srikakulam districts from 10 June to 9 February and excavated a well on the riverbed in Adalpur village in Ranga Reddy district on 10 June. (iv) West Bengal: Saradapitha centre installed two arsenic and iron removal plants in Nadia district on 21 March 2016 and 5 January 2017. (a) Karnataka: Ponnampet centre constructed 3 public toilets at Halligattu Deva colony in Virajpet taluk of Kodagu district in February. On 14 April, Chennai Math handed over 22 newly constructed low-cost houses to 22 poor fishermen families of Pattinapakkam area in Chennai. The centre handed over the Swami Vivekananda Community Hall and Educational Centre and 60 low-cost houses at Meliruppu Panchayat area in Cuddalore district to affected families on 28 June. Each family was also given a stove and an LPG cylinder on the occasion. 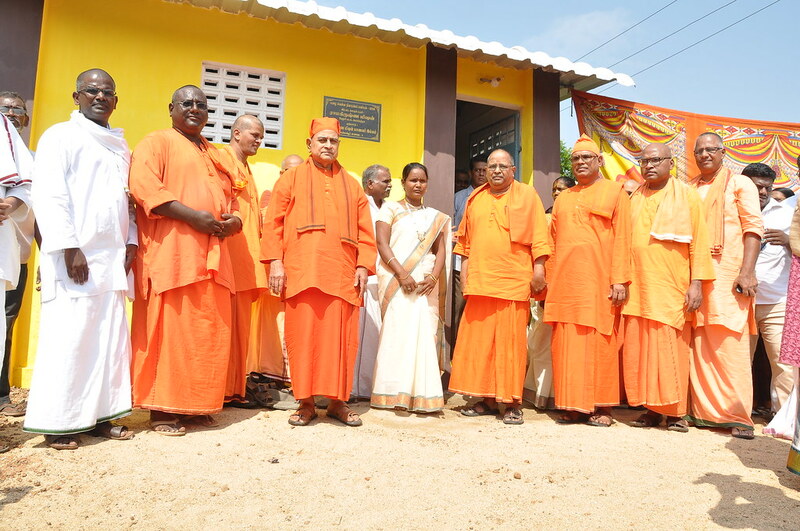 Chennai Students’ Home handed over 19 newly built low-cost houses and 13 additional toilets to flood-affected Irula tribal families of Thathaimanji village in Thiruvallur district on 6 April and the settlement was renamed as Vivekanandapuram. On the same day the centre also distributed 31 cots and an equal number of racks, stoves, utensil sets and blankets among 31 poor families. The centre handed over 14 newly built low-cost houses to poor flood-affected families of Kanchivoyal village in Thiruvallur district on 24 September. 40 low-cost houses constructed by the centre were handed over to flood-affected families at Poovalambe village in Thiruvallur district on 27 October. The locality where the houses had been constructed was renamed Ramakrishnapuram. On the same day the centre distributed 46 stoves and an equal number of saris, T-shirts, steel racks, mats, dustbins, buckets and mugs to 46 poor families of the village. The centre handed over the newly built Sister Nivedita Community Hall to the people of Thathaimanji village in Thiruvallur district on 20 December. 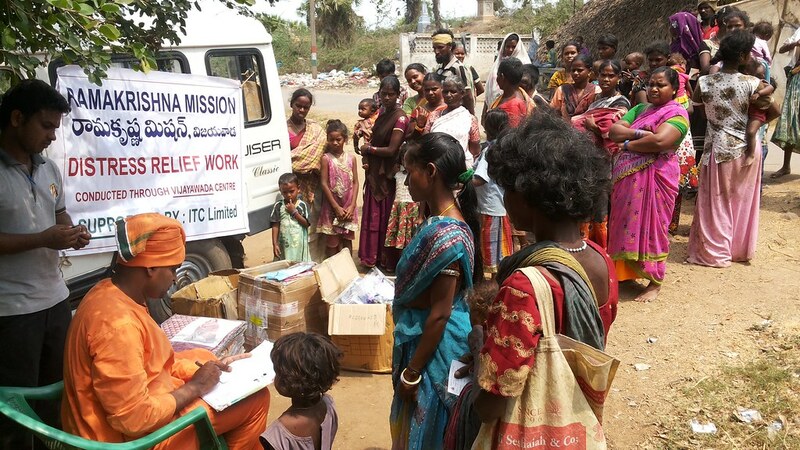 Continuing its rehabilitation work in the flood-ravaged Kallur village in Thiruvallur district, the centre distributed 1 fishing boat (along with a diesel engine and a fish storage box), 48 fishing nets, 21 goats and 17 tarpaulin sheets among 17 poor tribal families in Kallur village in Thiruvallur district on 11 and 25 January. Further, 25 saris, 20 dhotis and 26 children’s garments were distributed on 25 January. (c) West Bengal: Purulia centre handed over 5 new houses to 5 very poor families in Purulia district from 17 June to 9 December. In the year 2016-17, 98 of our branch centres distributed the following items to poor and needy people in their respective areas: 2,12,103 shirts, 1,99,290 trousers, 19,133 t-shirts, 85,359 tops, 9239 women’s dress, 2420 leggings, 1699 frocks, 24,779 saris, 14,847 dhotis, 664 lungis, 28 churidars, 3579 assorted garments, 1218 school uniforms, 3871 children’s garments, 1464 chaddars, 521 towels, 195 pairs of shoes, 27,409 pairs of socks, 535 bed sheets, 4741 mosquito nets, 13,970 kg rice, 3670 kg flour, 1702 kg dal, 1300 kg suji, 2441 kg sugar, 1630 kg salt, 41 kg turmeric powder, 2006 kg edible oil, 200 kg potato, 11,298 packets of biscuits, 234 kg nutritional drink powder, 90 kg tea, 3.74 lakh halogen tablets, 1943 phials of hair oil, 1810 sachets of shampoo, 4345 bars of soap, 995 bars of washing soap, 67 kg washing powder, 670 tubes of toothpaste, 60 toothbrush, 385 school bags, 12,148 erasers, 1562 geometry boxes, 4721 pens, 13,408 pencils, 11,948 sharpeners, 200 rulers, 2176 textbooks, 80,684 notebooks, 36 distas of exercise paper, 220 boxes of crayons, 515 plates, 25 tumblers, 80 tiffin carriers, 434 solar lanterns, 51 bicycles, etc. We express our sincere gratitude to all the volunteers and devotees for their painstaking hard work in these relief activities. We also extend our cordial thanks to all the donors, benevolent organizations, government officials and others for their participation and cooperation in this noble endeavour. May the blessings of the Lord shower upon all!